COMMERCIAL AVIATION DIPLOMA PROGRAM - TWO OPTIONS! The Commercial Aviation diploma program is for men and women who are interested in pursuing a career in aviation. 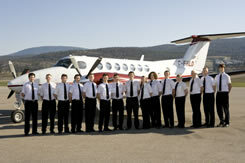 The program provides students with business experience along with the aviation training required by Transport Canada. 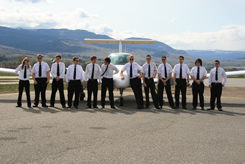 You graduate with an Okanagan College Aviation Diploma, which is backed by essential business knowledge, as well as a Commercial Pilot Licence, Multi-Engine Iinstrument Rating, completed IATRA exam and well-prepared for the ATPL Exams. You can carry on into a BBA and/or also get a Flight Instructor Rating to start working for us! If you already have your Canadian Private Pilot Licence, please contact us regarding entering the four-semester Commercial Aviation Diploma program in September. If you do not have your Canadian Private Pilot Licence (PPL), you will start the Commercial Aviation Diploma program in January, in order to acquire the PPL during the months of January through August. Please click HERE for information. Jazz Aviation LP ("Jazz") is pleased to announce a further commitment to Canada's future professional pilots with a new agreement between the airline's Jazz Aviation Pathway Program ("Jazz APP") and Okanagan College's ("the College") Commercial Aviation program. Students have the opportunity to qualify for financial awards and employment interviews at Jazz. Porter Airlines provides interview and mentorship awards, to help successful candidates reach their goals of working for Porter Airlines, or reaching other employment destinations they may have. Westjet and Encore provide employment interview and financial awards, as well as student ambassador opportunities to successful candidates in the program. Carson Air provides instructor training opportunities, as well as employment opportunities on freight, charter and air ambulance aircraft based in Alberta and British Columbia. Most major airlines in Canada and around the globe require a diploma or a degree for consideration of employment opportunities. Pilots are the face of the airline and are ultimately in charge of their own sub-business each time they walk aboard their aircraft. 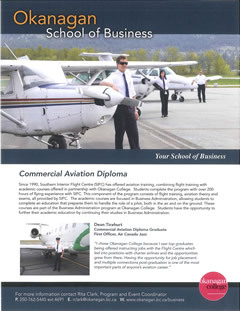 In partnership with Okanagan College, SIFC has created a business-backed aviation diploma which provides the required aviation training, as well as business knowledge essential in today's aviation industry. The Commercial Aviation Diploma Program includes the Commercial Pilot Licence, VFR Over-The-Top, Night Rating, Multi Engine Rating, Instrument Rating, IATRA and preparation for the Airline Transport Rating Exams. You graduate ready to tackle the aviation industry head-on! The Okanagan College web site discusses all of these topics on their Commercial Aviation Diploma program pages, click HERE. Students will also have to follow our Enhanced Training Policies (UPDATED March 2019) which set our graduates apart from the rest of the pack. Check out the Online Calendar for the various course descriptions for students enrolled in this exciting program. Click HERE. While the academic portion of the program is typically completed by April 30 of each year, students should plan on continuing into the summer months each year to complete the flight training and Transport Canada flight test/written exam portion. This allows us to ensure professional standards and safety are maintained when training times are influenced by weather, maintenance, and examiner or individual student availability issues throughout the program. To best emulate the aviation industry, training occurs seven days per week. While we make an effort to accommodate students who have part-time employment, occasions arise requiring the scheduling of weekend and other courses with little advance notice. These courses require mandatory attendance and will form part of the final grade. APPLY HERE to secure your position in the course! Note: International Applicants for the Diploma program can apply Here. Check out our Testimonials page to see how well the program works. 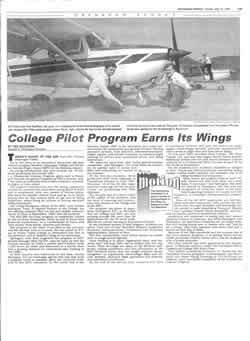 We've been in the business of training Commercial Aviation Diploma Students for decades! APPLY HERE for the Commercial Aviation Diploma Program. An interactive flash brochure for Okanagan College can be loaded by clicking HERE. You may have to allow pop-ups. 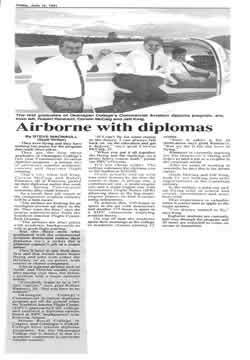 The Aviation Diploma is on page 18. Check out our FUNDING page for helpful information on student loans. We are known for our ingenious solutions to common problems; truly a 'Can-Do' attitude.